Since I started racing, I have pushed myself through a lot of different sorts of terrain, from pavement to swamps to mountains. 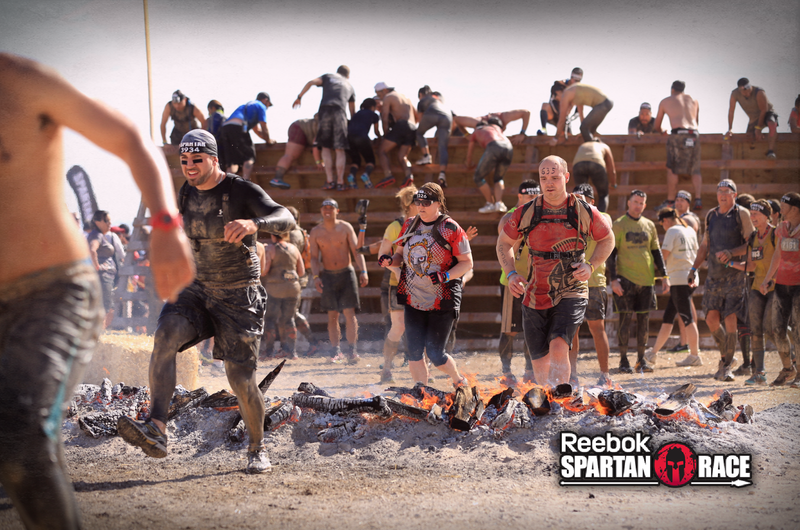 When I was invited to run the Spartan Super in Las Vegas, I was excited to add desert to the list. I had agreed to help a few newer racers through the race, one of whom was just recovering from a respiratory infection, so it was clear from the start that we were going for a finish without regard to time. We ran a few hundred yards out of the gate, then slowed to a quick walk for most of the course. The terrain was nearly all gravel and sand, always sliding underfoot and getting into everyone’s shoes. At several points we stopped to dump the sand out and retie shoes, only to have them refilled 100 yards later. We made good time through the typical beginning obstacles, over under through and short walls, then came to the big gravel hills and the bucket carry. Signs were posted to not carry the bucket on your shoulder (they say for safety reasons, but most of us thought it was just to make it more difficult). This is likely one of the most brutal obstacles, I had to put the bucket down for a moment 4 or 5 times before completing it. I ran ahead of my battle buddy to knock out the atlas carry, then helped her complete hers. It must of been amusing to watch: I pick up and hand off the weight, run around the edge of the lanes to meet her at the far end, crank out burpees, pick up and hand off the weight again, and run back to the start point. 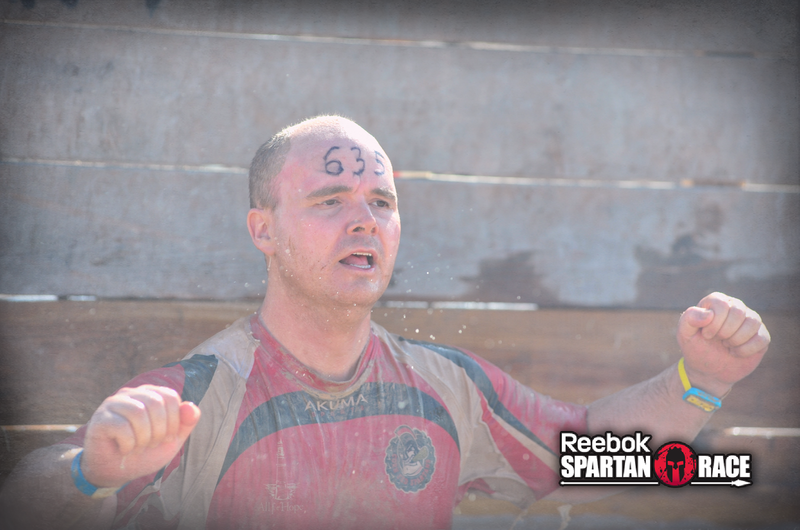 We caught up with the rest of the team at this obstacle and continued on together. The next item of note was the monkey bars. She gets up on the bars, puts feet on my shoulders to help her across, we get through and go back to repeat for me. Feet on her shoulders, and she hits the afterburners. I am grabbing bars as fast as I can to keep up, course official is laughing, but I made it. We each went back and helped one of the team (who I referred to as the Ladies in Blue) across. The last was going to skip the obstacle entirely, saying she couldn’t support her weight long enough for someone to get under. I asked if she could lift one knee enough to put it on my shoulder. The uphill and downhill gravel trudge continued, and I came to understand what dust storms are like. When it gets stirred up, you can’t see ten feet and breathing becomes a chore. The next memory that stands out is getting the team over the inverse wall. I cleared the wall and returned to help the rest. We would help push the person up to get a grip on the top of the wall, and if they had trouble from there I would go over the top to help them the rest of the way. I was impressed with myself, I completed the obstacle 5 times in about 10 minutes. 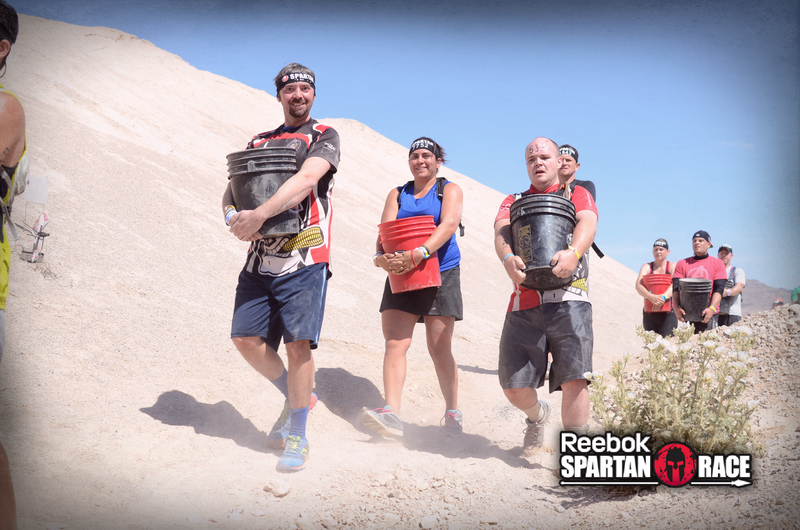 The sandbag carries at this race were tougher than many I have seen at beasts. I started the last one with my bag and my battle buddy’s, but she ended up taking hers back when I was having trouble keeping the load balanced. In weather as hot as this was, the dunk tank was brutally cold. Find the bottom of the wall, plug nose, and push under. Over the slick wall, over the fire, and taking a moment to mourn the serious lack of gladiators. This was by far the toughest super I have done, and on par with the SC Beast in difficulty. US Trifecta 2/3 complete. Utah, we are coming for you. Posted on April 23, 2014 by themonkofthemud. Bookmark the permalink. OMG, I got a great laugh on the monkey bar part. “Feet on her shoulders, and she hits the afterburners. I am grabbing bars as fast as I can to keep up, course official is laughing, but I made it.” Actually busted out laughing here at work! It was a pretty great race I thought., but was coughing up the desert for a couple days afterwards. My SC3’s help up well with the sand and gravel though. Only stopped once to empty.